Advantage is a long-lasting, once a month topical flea treatment. This over-the-counter formula is for cats and kittens 8 weeks or older. Advantage contains imidacloprid, this quick acting flea preventive stops fleas from biting in 3-5 minutes, begins killing fleas inside the first hour of application and eliminates ninety eight%-100% of adult fleas within 12 hours of use. The ingredient imidacloprid works by affecting the flea or tick's nervous system. 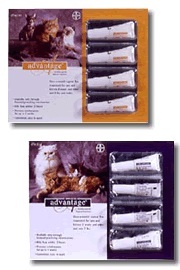 As a result of Advantage works quick and has been found to be effective for cats affected by Flea Allergy Dermatitis. Research demonstrates that Advantage kills re-infesting fleas within 2 hours and lasts for as much as 4 weeks.